We're home!!! Sophie had chemo yesterday, and the preliminary results of her spinal tap looked good. We're supposed to hear back about the bone marrow biopsy today, but if it shows no leukemia, she won't have to have another spinal tap until the end of February. She'll have the IV chemo every Tuesday through the end of the month. They gave her a red blood cell transfusion because the red count is likely to drop low this week, and they wanted to avoid having us come all the way back just for that. She's at risk of infection right now, so we're keeping her at home until her blood counts improve (and no one can visit if they have a cold). We came home pretty late last night, and we have a fistful of prescriptions to get filled. The home health care nurse will come tomorrow (and three times a week after that) to give us supplies for taking care of her chest catheter and to continue teaching us how to do it ourselves. We spoke to Sophie's oncologist today, and he said the results of her bone marrow biopsy weren't as good as they had hoped, but they did show great improvement, so he's not too concerned. He said the results showed that Leukemia cells are still taking up 40% of her bone marrow. They'll go ahead and do another spinal tap and bone marrow biopsy on Tuesday in addition to the chemo she already had scheduled for that day. The results of next week's biopsy and another test they'll run on the 28th day of treatment will determine the intensity and length of the next set of treatments. We're also scheduled to take her in to UNC on Friday to do some bloodwork, since her blood still doesn't seem to be clotting normally. Sophie was not terribly fond of the home health care nurse, but it seems like we've got most of what we have to do under control, so it doesn't look like the nurse will come that often. She had her first bath at home. She definitely handled it better than she did at the hospital. Sophie is very sensitive about having her chest exposed, and is espeically agitated during her bath. We bought some plastic-backed bibs, which not only keep her covered and more comfortable, they keep the catheter dressing from getting wet. Sophie slept during most of the day. She was usually up for about an hour watching TV or eating and then took 2-3 hour naps. She did manage to climb up on the couch all by herself (rather than being carried everywhere), so she is starting to feel more independent. The steroid Sophie is on has definitely affected her appetite. She has now switched from nonstop requests for cheetos and chicken soup to popcorn and cheese grits. Sophie had a pretty good night. She called out for Susan once at 3:00 a.m., asking for a diaper change and insisting on a bowl of soup. She happily ate it and went back to sleep. It's like dealing with a newborn again! She has spent much more time today awake and alert. There was only one short nap this morning. Today's food craving is hot dogs. Oma (Randall's mom) arrived today, and that brought a smile to Sophie's face. Tomorrow morning we head to Chapel Hill for a blood check in the oncology clinic. We headed to the UNC oncology clinic this morning and arrived at 9:00. After a brief check-in with the nurse, we met with Dr. Gold to review her health and answer our questions. They drew blood, and we waited for the results just in case she needed a transfusion before we went home. Her platelets were low, so they gave her a platelet transfusion. It took a while before the platelets arrived, so we were there for quite some time. After the transfusion, the nurse helped us as Randall changed the dressing on Sophie's catheter. He did a great job, and so did Sophie. We finally arrived home at 5:30. What a day! She did really well during all those hours in the clinic, and her doctor says she looks great. We'll head back to Chapel Hill on Monday for another blood draw to make sure she doesn't need more platelets before her Tuesday early morning bone marrow biopsy. We're looking forward to a quiet weekend. Sophie had a good day, although she's been pretty fussy. Although the normal reaction to the chemotherapies is constipation, Sophie is certainly having large volumes of the opposite reaction. We've been doing an incredible amount of laundry. It also means her "tummy hurts" a lot. One thing we decided to do was to cut out milk form her diet. She's been very happy with the grape juice we provided as an alternative. Her food cravings today have been hot dogs and chicken soup. There have been quite a few happy moments today, and it's good to hear her laugh. Sophie gets a little better each day. She spent much of the day with Oma (Randall's mom, Karin), while we went to church, and spent some special time with Elisabeth. She did a bit more walking today, and she added a little variety to her diet by eating some shredded mozzarella cheese. She's definitely still having some intestinal problems, so we're going easy on the cheese. We called the doctor about it, and they said they would run some tests when she's in the clinic tomorrow. Today is Sophie's last day on this course of steroids, so we're hoping her mood will improve over the next few days. We had a tough night around here. Sophie did pretty well. We had her normal midnight-snacking demands (she was up about 3 times for a diaper change and snack). Unfortunately, both Randall and Karin got some sort of serious stomach bug and were violently throwing up most of the night. My mom got sick like that the day she got home from visiting us. I don't know if this is the same thing or not. Randall and Karin didn't eat any of the same foods yesterday, and in fact, they were hardly in the same room at the same time. I'm thankful Elisabeth, Sophie, and I don't have it (yet), but if Sophie gets it, it could be incredibly dangerous, and she would probably have to be hospitalized. Sophie's got a hectic schedule early this week, but then it calms down. Later this afternoon, I'll be driving her to UNC for a blood test (they need to see whether she needs any transfusions before tomorrow's procedure). Randall was supposed to go to class (finally) today and then was going to meet us at the clinic, but I doubt he'll be able to go. After clinic, Sophie and I will go to a friend's house to spend the night. She has an extra room with a queen bed and a daybed--perfect for us. We're supposed to be at the clinic on Tuesday at 7:00 (which is why we're spending the night). Assuming the anesthesiologist doesn't get pulled away, they'll try to schedule her first for her bone marrow biopsy (because she is on steroids and will be quite hungry after not eating all night). Then she'll get two types of chemo injected in her line. We should be able to go home right after. Yesterday was her last day of steroids, so now all she takes is an anti-fungal medication, an antibiotic, zantac, and a diuretic (she had high blood pressure on Friday). We had a successful trip to the clinic with Sophie. Randall felt well enough on Monday afternoon to accompany Susan on the trip. We took her in to the clinic to have her blood tested, and then we went to a friend's house to spend the night. She's a mom of two-year-old twins, so she had all kinds of food and snacks of interest to Sophie. Susan started to feel pretty queasy during the night, so Randall took care of Sophie during her middle-of-the-night requests for food and TV. We got up in the morning and drove to the clinic to check in. Because Sophie is just coming off of steroids (and is unusually hungry), they did her bone marrow biopsy (with anesthesia) early--she was one of the first procedures of the day. She came out of anesthesia fairly quickly and wanted yogurt right away. We waited a while longer while they ran the chemo through. While we were waiting, we met a very nice couple and their son who is just a few weeks older than Sophie and was first diagnosed with ALL back in September. It was helpful to hear about their experiences. Dr. Gold called a few hours after we got home and said that the biopsy showed that she has 2% blasts present in her marrow. That's down from 40% last week and approximately 90% when she was first diagnosed. We're still not sure what this means in terms of the length and intensity of her treatment, which depends on the bone marrow results at days 7, 14, and 28. Sophie was very happy to be home and was very cheerful as we pulled into the driveway. She was also happy to be able to finally get some "Dora soup." Her new food discovery last night was american cheese dipped in peanut butter(!). We're back in the hospital. We noticed late this morning that Sophie was running a fairly high temperature (over 101), so we called the doctor, and they said to bring her in and pack a bag in case they needed to admit her. On the drive in to the hospital, Susan was so distracted, she forgot to take the exit to I-40 from I-95 and nearly drove to Virginia before she realized it! When we got to the clinic at 1:30, she was not running a temperature at all (that figures! ), but they said they wanted to admit her anyhow. They gave her two antibiotics through her IV while we waited for a room. By the time we got to her room at 5:30, her temperature was over 101 again. Randall headed home at around 6:30, and Susan will spend the night with Sophie. They will hold Sophie in the hospital for at least 48 hours, so we hope to be out by Friday night. Karin is taking care of Elisabeth at home, and we're all over the stomach flu. She's been in a good mood all afternoon and has hardly fussed. She's still not asleep now, and it's nearly 9:00. Shouldn't be long now. We happen to be in the same room we were in before (thank goodness, because it's a big one! ), and the phone number is the same, for those who still have it from before. Otherwise, call us at home or leave a message on my cell phone and we'll get you the number. Wish us luck! Sophie has had a good day in the hospital today. She's been in a great mood, and has been very playful with the staff and with her visitors. Her blood counts are getting better, although she's still neutropenic (at risk of infection because of low white blood cell counts). Everything is moving in the right direction, and there's no indication yet of any bacterial infection (they continue to watch the blood cultures). She did have another high temperature today (101.7), but it went down with tylenol, and as of 8:15 this evening, it was back to normal. Sophie had a bath tonight (which she tolerated pretty well), and they changed the dressing on her catheter (which she tolerated less well). We haven't had a chance to talk to the doctor about whether the fever she had today will affect when she goes home, but this morning, the doctor said that as long as nothing shows up in the cultures and all her vital signs look good, she should be clear to go home tomorrow. If any of the cultures are positive (indicating a bacterial infection), they would start a new course of antibiotics, and she might have to stay until Tuesday (after she gets her next round of chemo). Susan is staying with Sophie in the hospital tonight, and everyone's looking forward to a good night's sleep. 11:00 AM: Sophie had a good night, and the middle-of-the-night food cravings seem to be gone. She did have a fever (101.3) at 5:00 this morning. They started another culture yesterday at 2:00, but they only do them every 24 hours if there's been a fever, so they won't do a third culture this morning. The first culture hasn't shown any growth (which is good). Her ANC (Absolute Neutrophil Count)--which is the best indicator of her risk of infection--was .3 this morning (it's been increasing by .1 every day). Her platelets are fairly low (18), but they won't do a transfusion unless she has visible signs of needing one or drops below 10. The doctor said that as long as her ANC is below .5 (and assuming nothing grows in the cultures), they will hold her for 48 hours following the most recent fever. Once her ANC is above .5, they will hold her for 24 hours. Given the rate of her ANC increase, it looks like Sunday morning would be the earliest we would get out of the hospital, but it could definitely be longer. 9:00 PM: Sophie continued to have fevers in the hospital most of the day today (and her most recent fever really didn't go down much, even after taking Tylenol), which means we'll definitely be pushing back when she can be released from the hospital. The cultures continue to show no bacteria growth, so there's no good explanation for the fevers. Her doctor suggested that she might have the flu and tested her for that, but it came back negative. Sophie definitely seemed more tired and more uncomfortable today. The unpredictability and total uncertainty of our situation really hit home with both of us today, and it's been really emotionally draining. We are both planners by nature, and that doesn't work well with this phase of her treatment. Tonight, Randall's mom is staying with Sophie in the hospital, while Randall, Susan, and Elisabeth spend some quality time together at home. Karin heads home tomorrow afternoon. 9:00 AM: Sophie and Karin had a very good night in the hospital. Sophie had a fever at midnight, but she hasn't had one since, even though the Tylenol has worn off. We haven't heard back from the doctor yet about her blood counts and cultures, but it shouldn't be too much longer. We had a wonderful evening at home last night--it's good to be home for a while. Karin flies back to TN this afternoon. It was so good to have her here helping out. We'll see how we do on our own for a little while! 8:30 PM: Sophie had another fever at 11:15 this morning, but she hasn't had another since (it's been creeping up though). Still no growth in the cultures. She's sleeping now, and the nurse said she'd hold off on giving her the evening medicines until 10:00 tonight so she can have a good rest. Our friend Ashley came by tonight and helped Susan give Sophie a bath. Sophie is pretty unhappy aboout any activity that exposes her chest catheter, so she cried through most of it, but then we took a walk down the hall (in her little pink push-car), so she was happy. She's been "capped off" (not hooked up to the IV) since about 5:30 and won't have to be hooked up again until 10:00, when they do the IV antibiotics. Other than the bath, she's been in a terrific mood. 10:00 AM: Sophie had another fever at midnight. The doctors are certain it's a virus and are going to stop taking new blood cultures, since none of the ones they've taken so far (one every day we've been here) have shown anything. Unfortunately, her ANC is back down to 0 (from a high of .3, which is still quite low). Her platelets and red blood counts are going up though, so that's good. If her ANC is above .5 tomorrow and she doesn't have a fever overnight, she can go home tomorrow. If it's below .5, we'll be here through at least Tuesday after her chemo (we'd have to come back for the chemo anyhow, so that's just as well). We just have to hope that the virus runs its course and the fever stays down. She's definitely on the crabby side this morning. 4:00 PM: Sophie's managed to avoid a fever so far today. She's been on the crabby side and hasn't been eating much, so the nurse suggested that her tummy might be upset. They gave her Zofran, and she's been more cheerful since then. Her blood pressure has been fairly high (diastolic above 80), but she's already on Lasix, so they're keeping an eye on it for now. She's playing with puzzles right now. It's a quiet day on the floor in the hospital--that's kind of nice. Noon: Sophie had another fever at 8:00 PM last night, so it's looking like we'll be in the hospital through at least Wednesday. This morning, her ANC was .1 (up from 0), and her platelets were down to 26 (from 32). The chemo will suppress her blood counts even further, so the 48-hour rule is likely to stay in effect. Susan is at work briefly this morning, and Randall will go to class this afternoon. Randall will be with Sophie tonight after his classes. 8:50 PM: Sophie has now gone 24 hours without a fever. If we can maintain that, we might be able to bring her home from the hospital by tomorrow night. She's had a good day. She hasn't had a huge appetite, but she did manage to eat a fair number of Cheetos. She went to play in the children's play area and went for several rides in her little pink push-car. She even walked a little bit, but she's very shaky on her feet. We're looking forward to having our whole family home at the same time. Elisabeth is doing well with all of this, but she definitely misses being with us. She says she feels left out. I think we all feel a little left out right now. 10:40 AM: Sophie hasn't had a fever since 8:00 on Sunday, so we're really hoping she might be able to go home from the hospital tonight. The doctors haven't shared her counts from this morning, but we assume everything is on track. She'll get two types of chemo today through her IV: vincristine and daunorubicin. Her hair is definitely falling out, and we hope to cut it short before too much longer. 1:00 PM: The doctor let us know today that although Sophie is not running a temperature, her counts are so low that they want to hold her in the hospital until they start to come up. Unfortunately, one of the chemotherapies she is taking today will suppress her counts, so they say the earliest we can expect to go home would be on Friday. Needless to say, we're disappointed. 2:00 PM: Wondering what's taking so long with the update today? We have a good excuse! Sophie was released from the hospital today, and we just got home. What a relief. Her ANC was 0 this morning, but the rest of her counts were either stable or slightly higher. Since she'd been fever-free for 72 hours and they know we can take good care of her at home and will call if she gets another fever, the doctors said she can come home. We're going to be very cautious about visitors for the next few days. Her energy level is pretty good. Even though she had chemo yesterday, she actually walked the loop around the entire 5th floor twice last night, and it was her idea. She took more steps on that little outing than all the walking she's done since the diagnosis. We were so proud of her! We're hoping she'll be eager to walk and play here at home too. 4:00 PM: Sophie has had a good time being home from the hospital. Last night, she and Elisabeth rode bicycle/tricycles in the driveway after dinner, and they had such a good time. The two girls played together with some of the coloring/activity books Sophie has received as gifts. Sophie slept through the night (as did her parents) and woke up in a fairly crabby mood (which is normal lately). She actually got out of bed this morning by herself, which she had rarely done before, so she seems to be feeling pretty independent. She's been home with Daddy all day and has been up and about a lot. She checks in with Randall when she needs a little attention but for the most part has been happy to putter around on her own. 9:00PM: Our major excitement for the day has been that Sophie got her hair cut. Her hair had already started to fall out, and since it was so long, it was becoming a bit of a nuisance (her hair was always getting in her face and mouth and we were finding long strands of hair everywhere). After her bath tonight, Susan sat Sophie on the counter and gave her a pretty decent bob. We all think she looks great! New pictures of Sophie are available. 7:00 PM: We've had such a good day today. Elisabeth's school was out today, so the girls stayed home while Randall went to class at Duke. We had a big snuggle fest in bed before he left, and we played and laughed all morning. The girls watched a movie together on their new portable DVD player (this will be a very good thing for future clinic and hospital visits), and Sophie took a good nap. Sophie has been running a low temperature (always under 99.5) today, but it hasn't gotten high enough to call the doctor. Sophie has been doing a lot more playing and talking and laughing, and it's great to hear her playing with her sister. 9:00PM:We had another good day today. Sophie seemed to be a little crabbier than recent days, but she was still pretty active and adventuresome. The weather has been warm so we all went outside. Sophie and Elisabeth played on the swingset and both girls rode their bikes (Sophie actually pedaled her tricycle for the first time today--she must have grown in the last couple of months). We are enjoying all this time together, especially having a real meal with all four of us at the table! All these simple pleasures are genuine reasons for joy. 6:45 PM: Sophie is doing well today. Randall and Elisabeth went to church today (Randall preached), while Sophie and Susan stayed home. Sophie had fun coloring and playing puzzles. Sophie's food obsession for today was "hopcorn." Her verbal skills seem to have expanded a lot recently. We told her that our friend Carole (who is a nurse) is coming tomorrow to draw some blood and will help us change the cap on her "tail" (catheter). Another friend came today to babysit the girls while we attended a meeting at church, and when Sophie saw Sylvia, she asked, "Are you here to change my cap?" Sylvia was happy to tell her that she wasn't! 7:00 PM: Sophie had a successful blood draw this morning. She was happy to see Carole and showed off her "tail." She only fussed a little bit when Carole drew the blood. The blood results were interesting. Her neutrophil count is still very low (.25), and her hemoglobin is about the same, but her platelet count is really good--within the normal range. I'm sure we'll hear more details tomorrow. She's had a good day home with Daddy and took a nap today. Randall is giving her a bath right now, and she's very unhappy about it. She's running a bit of a temperature but not high enough to call the doctor. We're looking forward to hearing the results of the bone marrow test they'll do in the morning. They'll also give her chemo and do a spinal tap with chemo. 10:30 AM: Sophie is having a successful clinic visit so far. They ran another blood test this morning, and her white counts (neutrophils) are slowly creeping up (still quite low at .6), her platelets are doing very well (254), but her red blood count is quite low (HGB is 7.2), so she will stay and have a red blood cell transfusion. The doctor said he looked at her bone marrow from this morning and didn't see any Leukemia cells at all, but the official results will take a day or two. But it looks very good so far for her to be classified as a "rapid early responder" and be able to skip a few courses of treatment. 4:00 PM: Sophie is home from clinic, and she is doing well. The red blood cell transfusion definitely perked her up. It turns out that the only chemo she got today was through the spinal tap. She didn't have to do the two IV chemo drugs she had been getting every week. We're thankful for that, because it will mean she has more energy over the next couple of days, and her blood counts should recover more quickly. We had a good talk with the nurse practitioner while we were there. Assuming that the lab confirms the preliminary results of Sophie's bone marrow test (showing very little cancer), they will test her blood weekly on Mondays until her counts are back to normal. 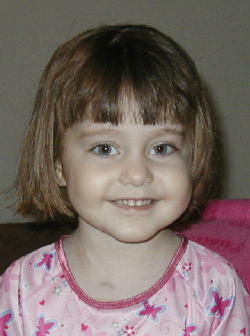 She'll then begin the next round of treatment, called "consolidation." We'll get more details over the next few days, but it will continue to involve weekly clinic visits on Tuesdays, and we'll be injecting one of the chemo drugs in her catheter at home. 11:00 PM: We still haven't received any word on the official test results from Sophie's bone marrow biopsy yesterday, but we should hear something tomorrow. We did call the doctor today because she seemed to be having constipation problems. After a couple of doses of medicine, we finally got a result this afternoon. We'll definitely try to stay on top of that, because a hospitalization for severe constipation can be rather unpleasant. 7:00 AM: Well, the laxative worked well overnight--too well! Oh my. Now we know what three days' worth of poop looks like (and I can tell you it doesn't fit in one diaper). That should certainly make her more comfortable today. 4:00 PM: We got good news today from the doctors. Sophie's Minimal Residual Disease (MRD, a sophisticated count of the number of leukemia cells in her bone marrow) was less than 1%. These are the results that we have been hoping for, as they confirm the earlier, unofficial indications that Sophie's leukemia is effectively in remission. For now, we will be in a holding pattern until Sophie's body is strong enough (and her counts are high enough) to proceed on to the next phase of treatment, which is called "consolidation." The goal of this next phase (and several phases after that) is to ensure that the leukemia does not return. Once this treatment starts (and it could start as early as next Tuesday), it will consist of a different regimen of chemotherapy over approximately two months. We will still have weekly clinic visits and we will still be wrestling with scary side effects from all the drugs, but as the doctor told us on the phone, today, we have a reason to celebrate! 7:00 PM: It's been a pretty good day for Sophie today. We checked with the doctor to see if we could stop giving her a couple of medications (Fluconizole and Nexium) now that she's done with her first course of treatment. He said that those had been prescribed primarily to deal with the effects of being on steroids (that she's no longer taking). We're happy to reduce the number of medicines we have to give her each day. Susan and Sophie took a field trip today and ran some errands out and about (all involving drive-throughs, since her blood counts are probably still low). She was happy to get out of the house and took a long nap afterwards. She was a total crab when she woke up (especially after we told her we weren't going to make more "hopcorn" right before dinner). She's not used to hearing "no" lately, so she really pitched a fit. She's happily playing with her sister right now though. 6:30 PM: The area around Sophie's chest catheter is red and looks a little infected to us, so we called our nurse friend Carole to come look at it. She said it was hard to tell, and she thought we should call the doctor. We did, and they said we should take her to an emergency room to have it looked at, and that we could choose whether to go to a local emergency room or drive in to UNC. We're going to take her to UNC, since the doctors are right there, and they have a separate pediatric emergency room. Since we're not sure what her blood counts are and how vulnerable she is to infection right now, it's probably a good idea to reduce exposure wherever possible. We don't know yet how they'll handle it if the line is infected. They mentioned giving her IV antibiotics, but we don't know whether they would have to admit her or not. We'll take an overnight bag just in case. Other than that, she's been doing well--no constipation or fevers. 1:00 AM: We're back from the ER. The doctors thought her line looked good and weren't worried about the amount of redness and seepage they saw. They took a blood test, and although she is neutropenic (her white counts are low--ANC was .4), she hasn't been running any fevers, so they thought she was safe to come home. They went ahead and gave her some IV antibiotics while we waited for the results of the blood test. 11:00 PM: It's been a good day. Our friend Cindy from Colorado has arrived, and we've spent much of the day catching up. Sophie's only health development for today has been a rather uncomfortable case of diaper rash (possibly a result of the IV antibiotics she got last night). We bought some Desitin (which seems to have the highest concentration of zinc oxide we could find) and are hoping that will take care of it. Meanwhile, she absolutely does not want her diaper changed. It's amazing how often we feel like we have a newborn again. Things we thought we were done with have come back into our lives (e.g., a wipe warmer, dipaer rash ointment, middle-of-the-night feeding during her steroid treatments). 11:00 AM: The results of Sophie's blood test from this morning are back, and the nurse practitioner says Sophie's neutrophil count is too low to begin the next course of treatment (the ANC is .24, and it needs to be above .75). This also means that she's still at a greater risk of infection. Her red count (10.2) and platelet count (414) looked good, so we probably won't need a transfusion prior to treatment. They will test her again next Monday to see if she's ready to begin chemo on Tuesday. Although we're eager to proceed with treatment, it will be nice to have a break from our weekly trips to Chapel Hill.